Breakfast. Tea. Light dinner. Satisfying snack. 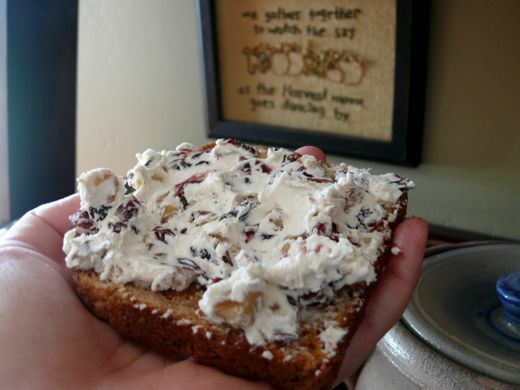 Bog Spread: Whipped cream cheese, crammed full of cranberries and walnuts. Do try this at home. 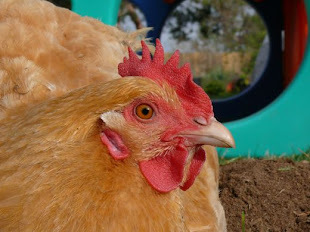 And before I share how it's done, I must remind everyone: Chickenblog is making no money. Unfortunately. Not one cent of ad revenue has found its way to our piggy bank, and so if I go on and on about a place, one particular shop, a favored Trader, please understand it is just my personal bias and affection for those marvelous purveyors of culinary delights. We call our concoction Bog Spread, because of the cranberries. Cranberries, true story, are grown in bogs, and bogs we know from our visits to Oregon. We have a fondness for Oregon, bogs, cranberries, and Grandma and Grandpa... especially Grandma and Grandpa, who taught us all things marvelous about Oregon, bogs, and cranberries. 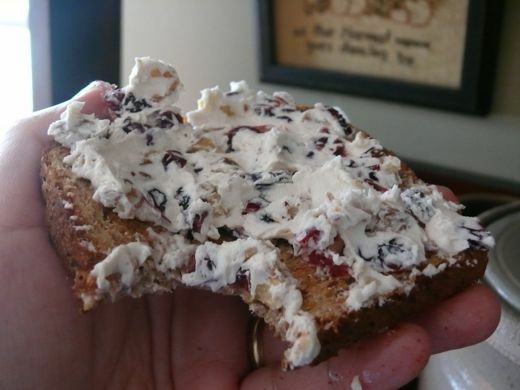 So to make the spread we get some cranberries, whipped cream cheese, and walnuts. This is not the kind of recipe that calls for measurements, or precision. This is about instincts, and flavor favors. Which flavors do you favor? 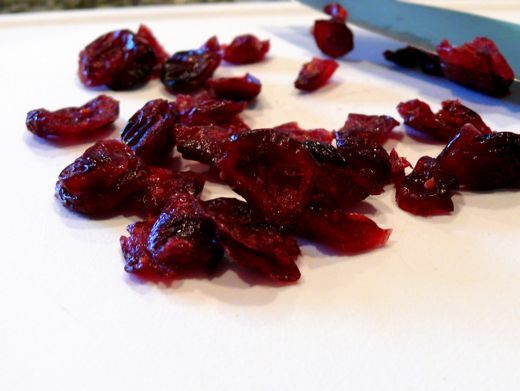 Alex and I favor the flavor of the cranberries, and we chop them up a bit before adding them to the cheese. All the cranberry bits wake-up and spread out in the spread. 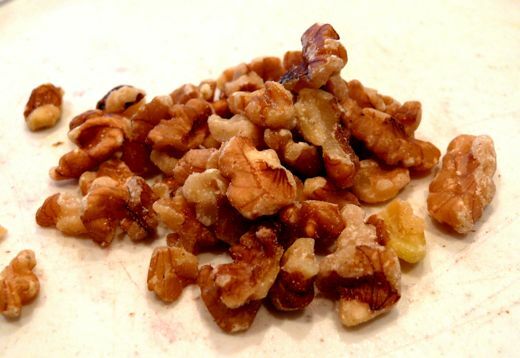 The walnuts add good flavor as well, and we favor the crunch of all those walnut bits, so we toss in quite a few nuts too. 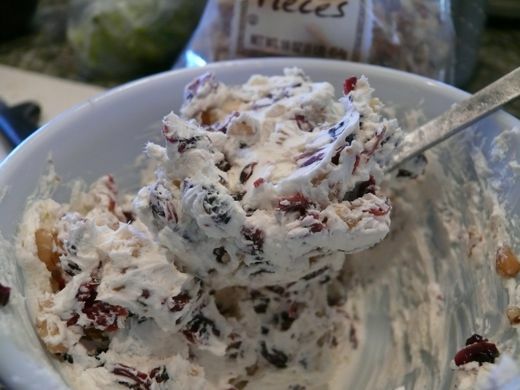 Whipped cream cheese, chopped cranberries, walnut bits... all mixed together in a ratio that you favor. This tastes delicious right away, and even better when the dried fruit and cheese have kind of melded together. I take mine on a slice of toasted honey wheat berry. But... after Thanksgiving, when the dishes are done, and the pie is almost gone... Alex and I will be in the kitchen making Bogwiches. Bogwiches are turkey sandwiches on the grainiest-seediest-toastiest-tastiest bread you can track down, topped with Bog Spread, and some leafy greens. Oh my. Looks great. I would definently try that. After seeing the quilted M over there I am insired to make another vintage sheet quilt. Or maybe I should just give away some of the fabric again. That was fun. Is it holding u ok. 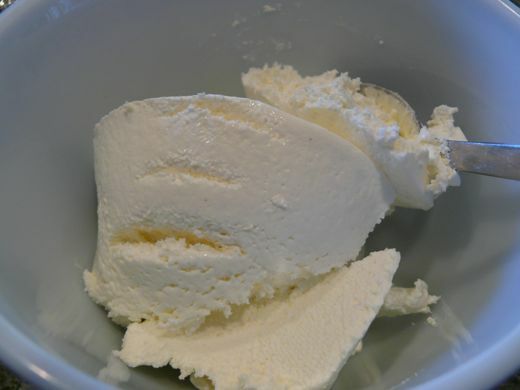 I am making Alex an after school snack right now! Your beautiful M quilt is as lovely and loved as ever. I like those sidebar photos, which click back to the post they were in. I hope a lot of visitors will click and read about your gift to us. MMMMM Yummy looking ,this evening I am making Apple Spice Muffins and think I will make your Bog Spread as well.Sounds like a perfect fall breakfast. oh my! that looks most excellent. 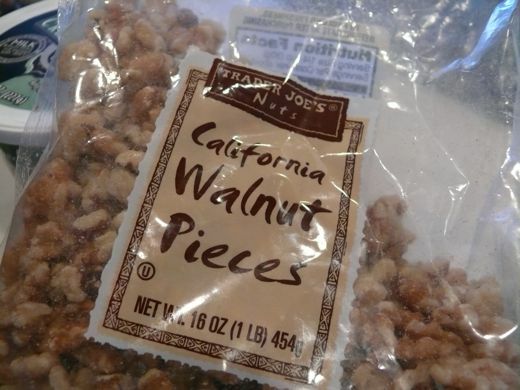 i'm seriously thinking about running to the store to pick up some walnuts. 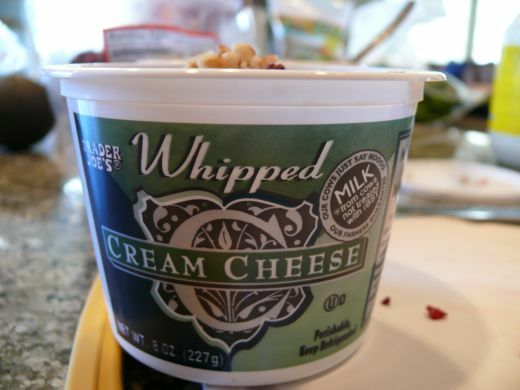 i have the cream cheese and cranberries. Oh My... Dear... I lost the comment box!! Anyways I was saying that Bog Spread looks and sounds delicious... I must have some soon! Oh my goodness, how yummy! In Montana the nearest Traders was two states away. I am loving having one 10 minutes from me. Great recipe idea-can't wait to use it! Natalie! Thank you for the banner compliments :) We're excited for the upcoming promotions on etsy an have been ordering cool new stuff that will hopefully come over the next several days. Gotta love the ordering -- it's one of our favorite parts! We're hoping to be super busy. Might have to whip up some bog spread for strength! At first I thought the title of the post was Dog Spread - wondering if you make the spread for the dog, or if it was made of the dog. I think I need to go see the eye doctor!!! It looks real yummy, except that I don't like walnuts. Do you think almonds would be ok to try?? That looks so simple and so good! I think I'll make it this week!! Just gotta go get the cranberries. Oh my indeed! This looks scrumptious! Hey everyone! I just love that so many people want to give this a try... yay!! I am picturing all of us at a big Bog party picnic... not a *dog* party, although dogs would be welcome! Many thanks for your comments. Spread the word!<-----Me, being punny! Yvette... Max won't touch the Bog Spread, because of the walnuts. I think it would be great with almonds. Or pecans? This morning the U-T said that eating walnuts helps your body deal with stress. Hmm, I thought that was wine. haha, WV was henica. Well, then... Bog Spread and wine. Helping my body is a good goal. Henica is my middle name. Thanks for the recipe - what a perfect spread for the holidays and I bet it's great on celery sticks, too. You asked about my camera. I'm using a little Canon PowerShot SD1000 that Amanda gave me for Christmas a few years back. Small enough to slip into your pocket or handbag, light and easy to use and has a great macro feature for closeups. This little gem has really delivered! Oh! My mind is so impressionable: Celery, of course! And already I am craving it! Canon PowerShot SD1000. Okay noted. Geoff has suggested that I get something like this, small and handy, because I am never without a camera. He thinks I should also get a second larger camera that I can use for those occasions when I am messing with the buttons. Thank you for your recommendation. You do take beautiful photographs. Oh yeah, this looks delectable! I see you shop at Trader Joe's too. Yummy. 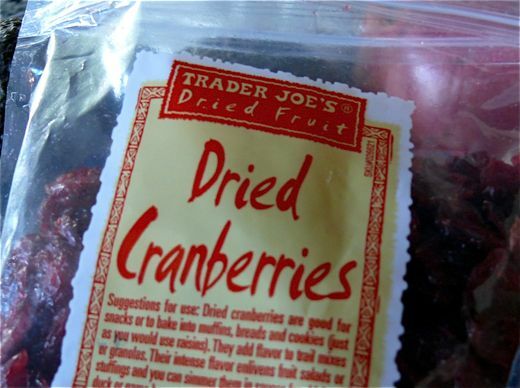 Dried cranberries. I must try it. Sara... I do. Our favorite yummys are there! Please be aware: The link from "Jen Strock" takes you to SPAM. I do apologize. I monitor comments and do my best to filter SPAM, but some things don't reveal their true selves until it is too late. I'm gonna try that bog spread! Sounds yummy!